Lieutenant General Jeffrey Talley used US Army funds to back promising Iraqi entrepreneurs to set up engineering and tech startups in a bid to lure young men away from the Iranian-backed militia. Can this strategy of “engineering the peace” be replicated elsewhere? 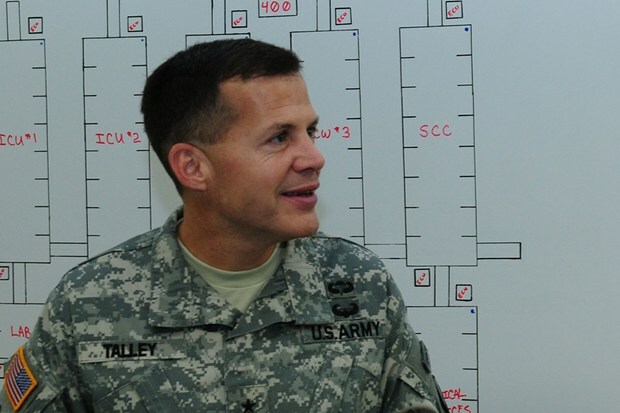 Six months ago Lieutenant General Jeffrey W. Talley earned his third star when he was appointed Chief of the US Army Reserve. Its 205,000 part-time soldiers form in their own right a large enough force to invade a country. Five years ago, in January 2008, this Irish Catholic entrepreneur, academic and now full-time soldier found himself dodging IEDs (improvised explosive devices) in Iraq, with a $500,000 bounty placed on his head by the Mahdi Army as he tried to restore security to the 2.5 million people who lived in the notorious suburb of Baghdad known as Sadr City. His crime had been to realise how he could use “good old-fashioned capitalism” to defeat the Iranian-backed militia that ran the city like the “old Mafia” used to do in the USA. Talley used US Army funds to back promising Iraqi entrepreneurs to set up engineering and technology start-up companies to get the water running again, the lights on at night and even the rubbish collected — on condition that they employed the same young Iraqi men who were the foot soldiers of the militia and paid them the same. “After all, if you can’t beat them, hire them,” he says. By decreasing the chaos on the streets there were fewer opportunities for ambushes and even — with the trash cleared up — for planting IEDs by the roadside. This strategy was so successful that between May and December 2008 the amount of violence was reduced from “astronomically high levels to extraordinarily low levels”, as a population tired of war began to back the new Iraqi government and provide the human intelligence necessary for the Iraqi Army to take out the militia. Now, in January 2013, a year after the US Army left Iraq, Talley believes there are lessons that the USA and its allies such as the UK can take from his campaign in Sadr City, to help deal with local threats — threats that are more likely to be the result of climate change, poverty, lack of security and migration than conventional war with another nation state. “The question was,” says Talley, “how many people are drinking the Kool-Aid of the militia because they believe in it and how many are drinking it for financial reasons? “I guessed it was between 10 and 20 percent and if you could provide a different way of life for the remaining 80-90 percent by helping Iraqis provide economic opportunities for Iraqis what’s wrong with that? It’s a lot cheaper financially and in terms of human life than the alternatives that can lead to the situation growing so bad that the only option is lethal force. “This way we leave fewer permanent scars around human hearts,” he adds. Talley’s new way of “engineering the peace” — or more cynically, using business as a new way of making war — grew out of his years in business and his research as an academic where he realised how effective it is to “invest people so they can invest in others”. He was then lucky that General Petraeus agreed to “give it a try” in Sadr City. And when this is combined with the power of engineering and the attraction of technology it can be “very powerful”, as these kinds of social enterprises can provide sustainable solutions that can relieve poverty and provide security because “to paraphrase the US constitution, they are by the people and for the people”. “Unfortunately, and rather ironically, we forgot that we were in Iraq, and a lot of the projects we built were what we thought people wanted, not what they actually did [want]. “I have been accused of promoting capitalism, but capitalism is not bad if it empowers people to help others,” he adds. Not only that, but it also depends, he believes, on the Army’s ability to draw on the wider range of “city-building skills” that reserve soldiers (such as the Territorial Army) have compared to the traditional solider — be it business management, logistics officer or even community worker. However, for former British Gurkha officer and author of The Insurgent Archipelago Dr John Mackinlay, “the trouble with taking lessons from Iraq or Afghanistan is that they were almost Victorian ideas of insurgencies”. Mackinlay is a teaching fellow in the War Studies Department, King’s College London. Insurgencies today, he believes, “are not monolithic like this. Rather they constantly evolve at very high speeds just like society does.” Often it is just the “fermentation of an enormous number of people twittering as they go”, such as we saw on the streets of Cairo and even East Belfast last week. So the challenge that the British Army faces — and this is where Mackinlay believes that Talley is on to something — is to become more of a “homemade, home enterprise security force” that is more “ordinary speaking” and more focused on a wider range of skills, so that like Talley’s reservists they can help key local leaders aid their own community. “Even though around 40 percent of the seed money will be wasted, there is a chance that 60 percent will have some effect as local people are more likely to listen to their own community leaders than an overweight, white male civil servant in his fifties,” explained Mackinlay. He believes that the part-time soldiers of the Territorial Army have, like Talley’s “wonderfully educated and well-disciplined” reservists, a key role. While the British military is thinking about the future, the US military has already put Talley’s strategy of “engineering the peace” into practice in order to implement the new military doctrine of “prevent, shape and win”. And in a “very low-visibility way in Africa” he is confident that they are already doing precisely that, as small units of his reservists are trying to build sustainable social enterprises “in health, agriculture and education”, with minimal American boots on the ground, while Chinese investment funds big capital projects with, Talley believes, little thought to how sustainable the project is after the contractors have gone. Tally agrees that there is also evidence of the same lessons having been learned in the way new startups are helping to revive war torn Mogadishu under the protection of the UN-backed African Union Mission To Somalia (AMISOM). Even in Afghanistan, he believes, progress can be made “at a very local level” — with fish farming , for example — even if it is at a very slow pace: “one community at a time”. Next The race to finger print the human voice.